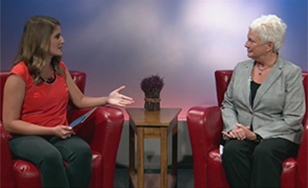 "Good Morning Northland" anchor Amy Adamle interviews Angela Hauger. Five of our faculty members were featured on WDIO-TV Channel 10's "Good Morning Northland" show, providing advice and insight to parents of K-12 students on how to make this the best school year ever for their children. John Bauman, M.A., assistant professor of Education; Chery Lucarelli, Ph.D., professor and chair of graduate Education programs; Laurie Anderson, M.A., Psychology instructor; Doreene Etongue-Mayer, Ed.D., assistant professor and chair of undergraduate Education programs; and Angela Hauger, Ph.D., Psychology professor and Gerontology program director, were each interviewed by anchor Amy Adamle during daily segments. They provided thoughtful tips and research-based best practices for parents to support their children in successful learning. On Monday, Sept. 10, John Bauman discussed ways to help children navigate the transition from home to kindergarten, from elementary to middle school, and from middle to high school. On Tuesday, Sept. 11, Chery Lucarelli talked about ways that K-12 schools are using digital devices in the classroom. On Wednesday, Sept. 12, Laurie Anderson discussed recreational "screen time," and age-appropriate digital technology usage for kids. On Thursday, Sept. 13, Doreene Etongue-Mayer talked about the importance of reading books to children and the powerful impact this has. Lastly, on Friday, Sept. 14, Angela Hauger discussed the unsung but widespread role of grandparents in the educational success of their grandchildren.